Jennifer Lawrence’s career would never have gotten the boost it needed if it weren’t for her breakthrough lead role in director Debra Granik’s 2010 drama Winter’s Bone, for which she received her first Oscar nomination, with the film itself receiving three further nominations including Best Picture. Now, of course, her star has skyrocketed since then and she has gone on to become one of Hollywood’s most celebrated actresses – all of that was made possible due to the fierce and extremely naturalistic performance that Granik instructed her to give. Now, Granik is seeking the same kind of results with young Thomasin McKenzie, a young New Zealand actress best known up until now for a brief role in the third Hobbit movie, but is the bright and shining centre of Granik’s new feature (and her first fictional piece since Winter’s Bone) Leave No Trace, a quiet and sobering look at an unconventional but affective father-daughter relationship that may be a fictional tale, but has its roots cemented in harsh reality. It concerns young Tom (McKenzie) who lives deep in the woodland area of a national park in Portland, Oregon with her father Will (Ben Foster), a war veteran experiencing some serious signs of PTSD. They live a harmonious existence, growing plants, eating mushrooms, drinking rainwater, and regularly running through drills in case they are ever caught. Unfortunately, one day, that does indeed happen when Tom is suddenly spotted by a jogger, who alerts the police to their presence. Both of them are forced back into civilisation, being set up with a makeshift home on a farm, but while Tom is more open to her new life Will is less eager, and soon he coaxes her along on an escape back to the wilderness, with decidedly mixed results. Just like with Winter’s Bone, Granik steers clear of clichés and stereotypes to tell a universal story that feels more real than not. Themes of homelessness and poverty certainly arise from a set-up such as this, but she avoids politicising the situation and instead just focuses on how these two characters happen to handle everything, from their uncivilised living conditions to their eventual predicament once back in society. Neither Tom nor Will are fully comfortable with the sudden change, especially Will whose severe PTSD has made him far more accepting of a reclusive way of life than a regular one, but since Tom is still young she is much more intrigued by what the world has to offer, including striking up a friendship with a local boy who introduces her to a nearby rabbit-training school, yet she blindly follows her father when he suddenly decides to retreat back into the wild. It’s an fascinating father-daughter dynamic, because while Will is never controlling or abusive towards her, he has still established himself as the dominant figure in this relationship, and his paranoia and unwillingness to change overshadows his judgement of what is best for his teenage daughter; meanwhile, Tom is first shown to have advanced knowledge of the rest of the world, and has decent enough social skills as seen in early scenes that see them wandering into the city to get supplies, but she only really develops a burning curiosity for it once she is given a taste of it, which causes her to question everything her life has been like up to this point. As they both experience highs and lows during their second-half voyage into the wilderness, the more it starts to dawn on Tom that, for once, her father might be going about it the wrong way, and suddenly what was once a harmonious relationship is being threatened by a stubborn denial to conform to a healthier way of life. Their shared arc is beautifully laid out by Granik and co-writer Anne Rosellini, leading up to a conclusion that will break your heart without any manipulative music set to it, with Granik injecting her trademark naturalism into this rough situation for the both of them along with some stunning nature cinematography by Michael McDonough which really captures both the bleak reality and also the colourful hopefulness of their predicament. The star of the film is, undoubtedly, a triumphant performance by Thomasin McKenzie, who at only 18 is outperforming even Ben Foster (also fantastic in the film) with her quiet, timid and sometimes playful nature that works wonders for her character who, up until now, has been largely absent from the world. She provides the film with its beating heart, as she goes back and forth over whether she wants to stay with her father on his seemingly hopeless quest or to stay in the world and make a life for her own, and the young Kiwi has screen presence and a half to make her character incredibly sympathetic in either situation. It’s almost eerie how this breakthrough performance of hers is nearly similar to that of Jennifer Lawrence’s one with Granik all those years ago, given how both actresses inhabit roles that see them tackle poverty, potential homelessness, and tough regulations set by her elders (though in this one, there are significantly less chainsaw amputations on corpses), and if Granik and the distributors play their cards right, this film could be within a chance for a few accolades this coming awards season; don’t be too shocked if you see McKenzie’s name pop up every now and then either, same with Foster and, of course, Granik herself. It’s a slow-burn of a movie, but it’s a highly intriguing one that should hold your attention just enough, especially with a young lead performance as good as McKenzie. She is just one of many things that make Leave No Trace a stunning movie in its own right. 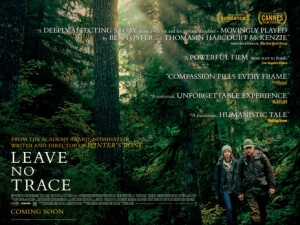 Leave No Trace is a stunningly quiet and subtle film that explores a fascinating father-daughter dynamic in an unconventional situation, and is held together by great filmmaking and a fantastic breakthrough performance by Thomasin McKenzie who outperforms even the great Ben Foster at times.